THE IRISH AVIATION Authority (IAA) has warned the public not to fly drones in the vicinity of fires, as emergency services continue to battle blazes across the country that have broken out as a result of the hot weather. Following a request from the civil authorities, the Air Corps have responded to requests in Dublin, Wicklow, Limerick, Cork, Tipperary and Offaly. 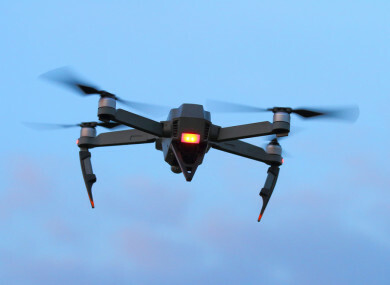 In a statement, the IAA said: “Do not fly drones, Small Unmanned Aircraft, or Unmanned Aircraft Systems in the vicinity of fires or these firefighting operations, as doing so could pose severe safety risks to aerial operations, flight crews and individuals on the ground. Since Wednesday, firefighters have been battling a major forest fire on the Slieve Bloom Mountains. An Air Corps helicopter and a private helicopter from Coillte have been brought in to assist. Speaking to RTÉ Radio One’s Morning Ireland, Coillte’s managing director Gerard Murphy said that there were 120 personnel on the ground in the area yesterday. He added that the fire is currently contained, but that there are still “significant hotspots”. “We’ve crews on the ground monitoring it and it’ll all depend on the weather. If the weather in terms of heat picks up today and wind starts to change direction, we could have a high risk again of it resuming,” Murphy said. He added that Coillte has been called out to around 60 fires around the country, and that 20 of them were “very significant”. Ireland’s current heatwave has seen the longest period of sustained heat in five years. Met Éireann’s Climatology & Observations Division yesterday issued a warm weather report for June up to Monday. The report shows that the hottest June temperature in over 40 years was recorded last Thursday at Shannon Airport, where the thermostats hit 32 degrees Celsius. That made it the highest June temperature since 1976, when Boora in Offaly hit 32.5 degrees. As a result, fires have been breaking out across the country over the past week. On Tuesday, Dublin Fire Brigade was called to grass on fire on the Oscar Traynor Road in Coolock. It also responded to gorse on fire in Blackglen Road in Sandyford, at the edge of the Dublin mountains. On Monday, a family escaped their car which had left the road on the Dublin Mountains after smoke from a heather fire suddenly changed direction. Advising the public ahead of the continued warm weather this weekend, Murphy said that the general public must “remain incredibly vigilant”. “It’s really important that people remain vigilant, report any suspicious activity, it’s really important that if they see anything suspicious that they report it to local guards,” he said. Email “'Severe safety risk': Public warned not to fly drones above wildfires”. Feedback on “'Severe safety risk': Public warned not to fly drones above wildfires”.